Social Media importance is increasing day by day. That is the best platform to add people to share knowledge and other activity with others. In past, most of the people connect with each other through the letter, phone. These tools take time and give the result very late. Social Media and other tools connected to people and provide the easiest key to share details in second. This is another thing that some users misuse the facility. If you use it for noble cause then that will strengthen our society and will give relief to others. Now come on main points - Your all activity restrict when teaching in 10th or 12th class. After that, you start to search for new ways to do something for you and your career. The basic concept behind is for student career start after passing the Twelve Exam or completing graduation. After completion of education, you start to collect information for higher education or job. The radius of connection has the limit if touch only that person, who knows you. The second most important thing is that you can’t know about the vacancy in a different part of the country. Your searching will be limited. Social Media help to provide a platform to talk and share content with those people, who are out of reach. You can interact with the people directly with Skype, Twitter, Facebook. These tools help for interaction. The company will hire if your presence, experience, education will be up-to-the-mark or fulfill the job criteria. Below are the details of the online platform, which can be used to search and connect with influential people to uplift your career. You can socially connect with important people. Online Certificate Course - These type, of course, is very useful to those students, who reside in the remote area and is totally disconnect with the town. They can register online and can get the certificate of available online course. Government is giving full support to this education process. You can get the advanced certificate course on Coursera.org . This organization is attached with renowned colleges like - Illinois Tech, Stanford, John Hopkins and are connected with digital marketing, creative writing, SAP, data science, business, skill, personality development and provide certificate courses online. News And Current Affairs - You can download some important Apps in your Smart-phone as per your need. These Apps help to update the current activity. In short, Apps help you to provide the update in the summarized way to save time. You can learn the content, which is important to you. The number of other Apps is available to update your interest area. For example - BBC, Firstpost, live comment etc. Internship Apps - To get the internship from any company, you have to upload your CV on social site like linked-in, Naukri.com, Monster.com, Internshala.com. They will send the notification to offer the work in your specified field. These help to get an opportunity to work in your esteem. LinkedIn Apps - This app helps you to add some big profile persons. They give the opinion and serve valuable content. If you follow them, then you can read some good article and research work online. To continue the attraction, you can give your opinion on the post. You will get active users, who can like your post and can vote for you. These activities will spread your appearance worldwide. It may be possible that the company offers work according to the profile. A company Glassdoor offers the opportunity to job seekers to talk the Company HR professional via social media. This is only possible if add your self to Social Media. University Website - Every institution information is available on site. Details can directly get, when open the web page. To get more information or other details, You have to register your self online. The institution will directly send notification mark on the update. They also provide toll-free and customer care number for you to ask any question. Twitter And Facebook - These platforms provide information about your daily activity. The employer can also search your page to know more about you and your activity. So, update your profile online with a good and positive post. Both platform also gives the opportunity to communicate your thoughts to those people, who are working in your specified area. They can help to spread your skill with other people. Twitter will restrict you to write content in words. This will learn you to express the view in minimum words in the right way. Similarly, your facebook page should contain valuable post with good stuff to attract visitors. Quora - This is basically a question-answer site. You can ask about any institution, organization, interview preparation process, examination pattern etc. The registered person will share the update and other details on your question. Basically, you will get the right to answer to your question. The person who answers your question, whose profile given on portal. So, you can know about the person educational details and profile. If anybody copy the answer, can be banned on Quora. Social Media is the best tool for you to add yourself to new people worldwide. Help to create the network and connect with the same stream people online. These platform branding your name and profile. Continue updating of post improve online presence and searching crawling. 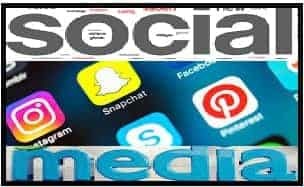 Your presence on social media helps to know about the present trends, marketing strategy and current affairs of your subject. It is very helpful to you to express your self among people. Your hesitation will be gone and will expand your thinking area. Today people hesitate to take the decision. That will reduce if interact with big profile people, it will also improve thinking the power to take the right decision at the right time for the right work. Precaution - Today people attract with social media platform but some misuse this. They use only for enjoyment. Recently founder of Facebook said that he established this platform to connect people, but today people are using it to disconnect. This should not be done. A platform should not be used to spread those things, which are not beneficial for human and animals. Every people connect with others to know something new and unique. If they receive wrong information and negative thoughts to others, then that will be spread wrong information on the first move. Massage should be spread to give pleasure to other people. Overall, today these platforms played a vital role to connect people worldwide.